Locally, the suit has sparked outrage among activists who have been seeking bird death data on wind projects in our region, without success. “Claiming irreparable harm is a lame excuse for wealthy investors like Warren Buffet/Berkshire Hathaway not to fess up to the number of birds they are killing with their industrial turbines,” says Donna Tisdale, Chair of the Boulevard Planning Group and founder of Backcountry Against Dumps, a citizens’ watchdog group that has filed suit seeking to block Tule Wind from being built in McCain Valley due to the threat to eagles, among other issues. She adds, “With the taxpayer supported 30% production tax credits, the $23 per megawatt hour and other lucrative taxpayer and ratepayer supported incentives [for industrial wind projects] the very least these wealthy companies/investors could do is be honest,” Tisdale wrote in an email to East County Magazine. Buffet has admitted that he does not build wind projects for altruistic reasons, such as reducing use of fossil fuels. “I will do anything that is basically covered by the law to reduce Berkshire’s tax rate,” Buffet told an audience in Omaha, U.S. News reported in May 2014. “For example, on wind energy, we get a tax credit if we build a lot of wind farms. That’s the only reason to build them. They don’t make sense without the tax credit.” http://www.usnews.com/opinion/blogs/nancy-pfotenhauer/2014/05/12/even-warren-buffet-admits-wind-energy-is-a-bad-investment. If the bird death totals are low, as predicted, why would the company not simply agree to release the data? If the death toll of protected species is steep, however, then release of bird death data could potentially have a chilling effect on corporate profits. If wind turbines are killing more birds than forecast, the government could require the company to shut down some turbines or deny approvals for future wind projects. Associated Press had sought the bird death records back in March 2013 under the Freedom of Information Act form Pacificorp, an Oregon-based company, as part of AP’s investigation into bird deaths at wind farms, including eagles. The company asked specifically for data collected under corporate permits regarding caracasses of protected bird species, such as migratory waterfowl and eagles, found dead at wind facilities. The sharp, fast-spinning blades can decapitate birds or wound them so severely that they die soon after of their injuries. AP had already documented 20 eagles found dead at Pacificorp wind facilities in Wyoming, through interviews with former wildlife officials, e-mails and other documents, providing sound reason for the wire service media outlet to seek out broader and more comprehensive information. AP has reported that the Obama administration was prepared to release the information, finding Pacificorp’s argument that the material should remain confidential “insufficiently convincing” to halt disclosure. In East County, there is good reason to suspect that more eagle deaths may occur than predicted at local wind projects since the eagle expert hired by wind companies to conduct the eagle studies was convicted in federal court of failing to turn over eagle data to the federal government. The expert, David Bittner, was also revealed to have been operating without a license for years and had four freezers full of dead birds illegally stored on his property, including protected species such as eagles. Bittner’s studies concluded that Tule Wind and Ocotillo Wind would not pose threats to eagles locally despite the fact that our region’s eagle population has been declined to only a few dozen nesting pairs, at most, and the Tule Wind site has historically been prime golden eagle habitat. Bittner pocketed hundreds of thousands of dollars from the wind industry for his studies. Ocotillo Wind is built, but Tule Wind has not yet broken ground in McCain Valley, though the Department of the Interior has approved the project by Iberdrola Renewables on public Bureau of Land Management property. 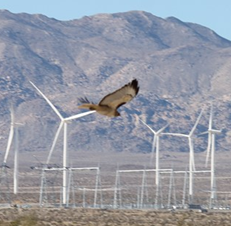 Efforts to obtain bird kill data on the nearby Kumeyaay Wind facility in Campo have thus far failedThat project is on tribal land, not public land. A witness has previously reported seeing a wheelbarrow full of dead raptors including hawks and owls at the wind site, where the public is not allowed to visit. They are worried about their company? THAT is what's WRONG and why they should NOT be in business - same for David Bittner. They should be worried about the IRREPARABLE harm to the eagle population and other birds - OUR American heritage. Reporting bird deaths, particularly Bald and Golden Eagles, should be mandatory (not voluntary), done independently (by biologists unconnected to business interests) and made available to the public. Why are we monitoring bird deaths in the first place if the public can't see the results? We can't know the truth without it. Besides, they are already violating laws that protect eagles and not being held accountable - why? We've saved the eagles before from DDT and now we're going to chop 'em up, electrocute 'em and fry 'em? McCain Valley is special and should be left just as it is - a home for Golden Eagles and other birds and wildlife. It used to be a conservation area until big business came along. And they are worried about their company?